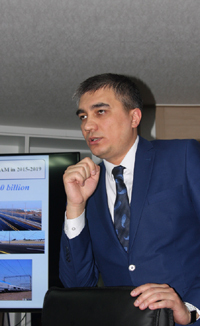 During the round-table organized on Jan. 28, 2016 by the Embassy of Uzbekistan in Seoul the participants were informed about the outcomes of social-economic development of Uzbekistan in 2015 and perspectives of bilateral Uzbek-Korean cooperation in the context of priority directions of the program of economic development of the republic for 2016 developed by the leadership of the country. As it was noted, despite some difficulties during last year, in Uzbekistan a significant work on renewing and reforming the country, achieving stable and sustainable growth rates and macroeconomic balancing has been carried out. Resolute steps in implementing important qualitative reforms aimed at advancing the ultimate goal - reaching the level of developed democratic states with strong socially-oriented economy, providing decent life for population of Uzbekistan, were made. A program aimed at carrying out deep structural reforms, effective protecting private entrepreneurship and small businesses as well as priority role of private property were singled out. The attention of the participants was drawn to Government's efforts on coherent reduction of the state's share in the economy. It was underlined that at this stage only enterprises in the area of extraction and reprocessing of hydrocarbons, precious and non-ferrous metals, uranium as well as strategic infrastructural branches of industry such as rail and automobile roads, air-transporting, electricity generation and municipal networks, will be retained under the state management. In the framework of the outlined tasks, during last year relevant work on creating necessary conditions for large sale of state assets, mainly, to foreign investors was carried out. On "zero" redemption value on a competitive basis 506 properties were sold to investors with acceptance by them of investment obligations. In addition, 245 low-profit and inactive organizations have been eliminated. 319 unused state properties went through inventory and put for sale to private owners. As a result 102 out these objects were sold to new owners during 2015. Appraisal of the state share in 378 joint stock companies were done in order to sale them to strategic foreign investors. It was noted that a principle of priority of entrepreneur's rights in interrelations with state, law enforcement and controlling bodies were introduced. In order to simplify and ease the creation and functioning of entrepreneurs more than 40 legal acts have were and amended. 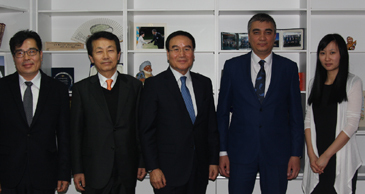 Uzbek Ambassador to Seoul Botirjon Asadov (2nd from right) poses with CEO Kim Yun-Seek (center) of Shindong Enercom, Policy Advisor Bae Seok-Neung (2nd from left)of the Youido Institute of Saenuri Party, President Kim Bae-Kyung (left) of GN1, and with Team Manager Tsay Lyubov of International Contractors Association of Korea (ICAK) at Roundtable held at its Embassy in Seoul, Korea. Mr. Kim Yun-Seek, ex-lawmaker, currently serves as chairman of Korea-Uzbekistan Friendship Association. It was underlined that work carried out in Uzbekistan on improving business climate has been positively reflected in rating by international economic organizations of the business environment in the republic. As it was noted in the report of the World Bank, Uzbekistan currently is among ten countries that over the last year achieved the best results in the area of improving the business environment for the entrepreneurs' activity. According to the rating of the reputed World Economic Forum, Uzbekistan in 2014-2015 was among the five countries with the most rapidly developing economy in the world. It is projected to retain its position in 2016-2017. In 2015 Uzbekistan became one of the 14 countries received an award for achieving the Millennium Development Goals in the area of ensuring food security by member-countries of the United Nations World Food Organization. During the round-table participants were also informed about extended work carried out in Uzbekistan on attracting investments aimed at implementing projects on modernization, technical and technological renovation of industries, structural transformation in the country's economy. In particular, in 2015 more than $15,8 billion was attracted and used that exceed the amount of 2014 by 9,5%. It was underlined that international experts highly evaluate the further strengthening the banking system of Uzbekistan, raising the level of its capitalization and expansion of investment activity of the banks. Moreover, despite the significant slowing down the growth of world trade, reduction of foreign demand and decrease of world price on important export products, Uzbekistan was able to achieve positive balance on foreign trade that resulted in the increase of state gold and foreign reserves. A number of projects that are currently being implemented in cooperation with Korean investors and specialist, including Usturt Gas-Chemical Complex (UGCC) on the Surgil deposit, were mentioned. The USCC with a value more that $4 billion is among one of the most modern, highly technological and biggest enterprises in the world. After its completion the complex will annually produce more than 83 thousand tons of polypropylene and increase the production of the polyethylene by 3,1 folds. In addition, jointly with the Government of Korea in Pap district of Namangan region a solar photoelectric station with capacity of 130 kWt was put into operation. Currently leading Korean companies and specialists are taking part in the construction of a various production lines and infrastructure in Uzbekistan. The participants of the round-table showed keen interest to the presentation of the State program of economic development, including the Investment program for 2016 that given the favorable investment climate in Uzbekistan open a myriad of opportunities for Korean investors. All-in-all, as it was noted during the round-table, achievements and perspectives of further development of Uzbekistan's economy once again prove the effectiveness of the development strategy adopted by the leadership of the country known in the world as an "Uzbek model."